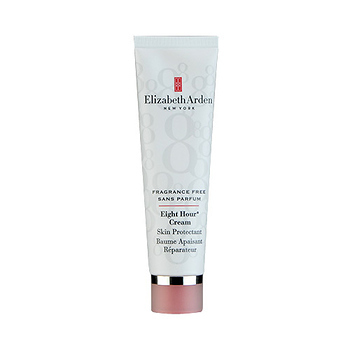 Elizabeth Arden Eight Hour Cream Skin Protectant (Fragrance Free) has the following features: Protect skin from drying wind, central heating and air conditioning. This skincare multi-tasker soothes, restores, calms and helps relieve minor skin irritations, including roughness, redness, chapped, cracked or dry skin. Found in top makeup artists’ kits worldwide, this all-in-one beauty tool adds shine to eyelids, cheeks, lips and legs. All it takes is a dab to smooth eyebrows and create a perfectly defined arch that will stay in place all day. Soften rough, dry cuticles to keep them smooth, supple and beautifully manicured. Smooth rough heels and soften soles for barefoot beauty in every season. With its legendary soothing and moisturizing benefits, it’s the ideal after-sun treatment to relieve minor sunburn and calm dry, irritated sun-exposed skin. Flying can leave skin looking and feeling dry and uncomfortable. Pack this intensive hydrator to boost skin’s in-flight moisture level wherever you go. Great for an après shave or après wax treatment. This classic cream calms irritation, reduces redness and leaves legs super-smooth and silky-soft.